Road safety is very much on our minds this week. 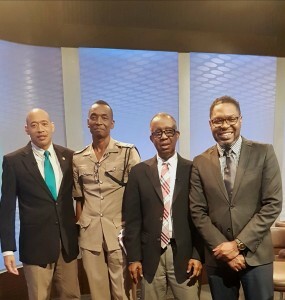 Just as the Road Traffic Act passed in the Lower House of the Jamaican Parliament, there has been a sudden and horrifying increase in fatal accidents on our roads. In a well-known danger zone – the insane racetrack that is the North Coast Highway near Rose Hall, St. James – three little girls and their driver died in a terrible accident. Two of the victims were sisters. Two more students remain in hospital. The John Rollins Success Primary School is in deep mourning, and my heart goes out to the school principal, teachers and students. The Road Traffic Act 2018, passed in the House of Representatives on November 14, cannot come too soon. It replaces an eighty-year-old act that is obviously extremely out of date – and poorly enforced. There were no hand-held devices and other distractions in those days, of course. And there were far fewer vehicles on the roads – and far fewer roads, too. Have you noticed that the more traffic there is, the more roads are built or enlarged – and after a few years, it hardly seems to make any difference? Be that as it may, I do hope the Senate hurries up and passes the Road Traffic Act – which has languished for four years – before the Christmas hiatus arrives and everything grinds to a halt. Speaking of little ones… Some weeks ago now, I found myself in the front yard of Early Steps Preschool in Duhaney Park, Kingston. In the shade of an almond tree, a group of small children clustered. Some of them wore purple smocks; others were in sports shirts and T-shirts. From inside the building, the voices of other children echoed. It was nearly lunchtime. Small children are easily distracted by things around them. Most of them, however, were focused on a police sergeant, who was teaching them the “ins” and “outs” of road safety. Young Sergeant Bennett (I thought he was young, but he swore he was well into his thirties) was really enjoying himself. He did impersonations of a large truck going down the road, changing gear noisily, which really impressed the children. 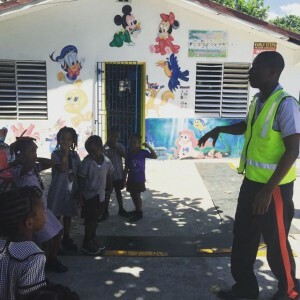 Using flat pedestrian crossings and stretches of road spread out on the yard, he showed them how to safely cross the road. At times there was slight panic and some giggling, as the children gently jostled each other out of the way of incoming “traffic.” In general, however, they took it all seriously. I had been invited by the Royal Optimists Club of Kingston (with the great acronym, ROCK) to join them for this event that they organized. 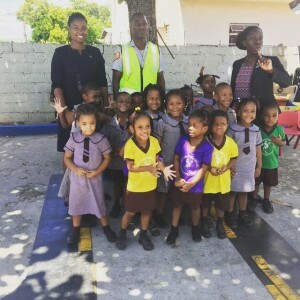 Parked in the driveway of Early Steps Preschool was a shiny yellow van, sponsored by the JN Foundation (who are greatly involved in the road safety public education thrust) and the Jamaica Automobile Association – as well as the police Road Safety Unit. What a great partnership! There is so much more to say about road safety, and much has already been said. I am hoping that with the new legislation there will be a true change – a sea-change, something deep. We need more than “public education.” We need more than enforcement. At the moment, we are just treading water. What don’t we understand about respecting life – our own, and the lives of others? P.S. ROCK has a New Year fundraiser coming up – a benefit play performance of Basil Dawkins’ Mass Mat Comes to Town. Date: January 30, 2019 Location: Little Little Theatre Cost: $1800 DO SUPPORT these wonderful, enthusiastic group of young people, making a difference. Find them on Facebook!